A Whiff of Deflation? Are Treasury Yields Any Indication?A Whiff of Deflation? 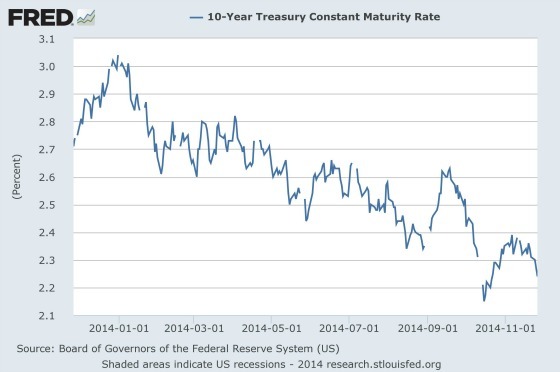 Are Treasury Yields Any Indication? A Whiff of Deflation? 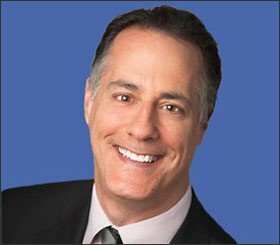 Are Treasury Yields Any Indication? There Appears to be a Whiff of Deflation in the air if Treasury Yields are any Indication. 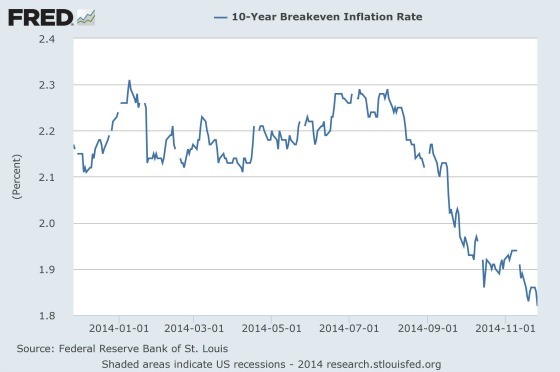 What is causing such a significant drop in inflation expectations? The Wall Street Journal had a good article about fresh signs of a global slump and the challenges it may pose to the U.S. economy. Here are the main concerns cited in the article. Lower oil prices – This could actually be stimulative to the global economy, although the strong U.S. dollar mitigates this somewhat since oil is priced in dollars. It also creates significant pressure on high-cost oil producers like Venezuela and Iran. Consumer prices in Europe grew at the slowest pace in five years, raising fears that it could be tipping into deflation. Economic growth decelerated in India in the third quarter. Subdued consumer and business spending in the U.S. in October. Eliminate demand dependent upon unsustainable credit growth – I think this is a lot easier said than done. The purpose for citing these is not to convey an opinion about the efficacy of them, but to illustrate how concerned some people are about the lack of demand there is in the global economy such that labor markets remain sluggish, wage growth muted, and savings that doesn’t circulate back into the economy piling up. Our bias, as previously mentioned in these blog posts, has been to be variable rate borrowers instead of fixed rate given our belief that interest rates would remain tame and the significant starting rate advantage. I see nothing on the horizon to change this strategy as that whiff of deflation comes rolling by. The classic pattern of lower highs and lower lows are suggesting signs of a global slump that may potentially pose a challenge to the U.S. economy. The current low-growth outlook is raising questions whether weak demand could dent the U.S. economy. Do you agree? 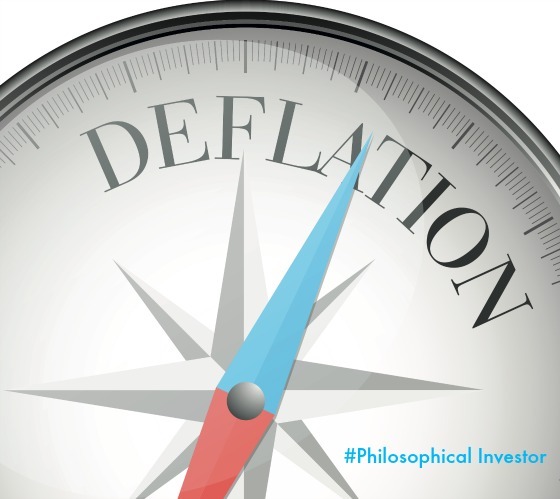 Is there a whiff of deflation on the horizon? I’d like to hear your thoughts. Thanks. I agree lower oil cost is stimulative especially if the cost stays high enough so the producers don’t have to cut back. Any idea what price per barrel starts to limit production? I think we’re already seeing it with all of the cap ex cutbacks announced by oil firms.